AKASTUKI will elucidate the mysteries of Venus, Earth's twin sister. 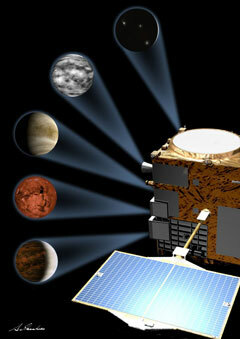 Infrared light enables more detailed investigation of Venus. 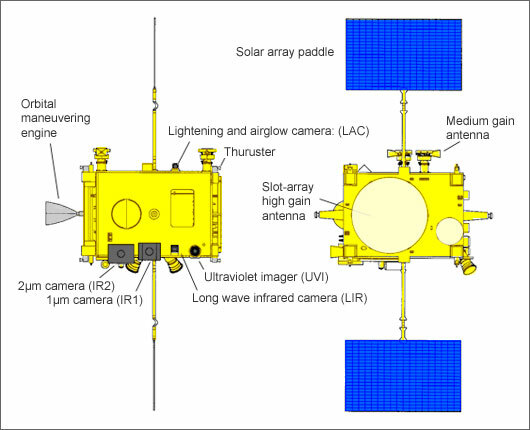 The probe vehicle of AKATSUKI will enter an elliptical orbit, 300 to 80,000 km away from Venus's surface. This wide variation in distance will enable comprehensive observations of the planet's meteorological phenomena and of its surface, as well as observations of the atmospheric particles escaping from Venus into space. It will also be possible to take close-up photos of Venus, and to observe the storm winds that blow on the Venusian surface, at speeds that reach 100 m a second - 60 times the speed at which Venus rotates. This phenomenon remains the biggest mystery of Venus, as it cannot be explained meteorologically. AKATSUKI will employ infrared light to observe and elucidate the mysteries surrounding the atmosphere under the clouds and the conditions on the planet's surface. In addition, it will confirm the presence of active volcanoes and thunder.